Disabled & Proud is being offered through the vConferenceOnline platform developed by bitsonthewire.com which has tested and assured us of the accessibility of the platform. Individual and Group Registrants will receive a dedicated link via email with login information. Check your email for messages from info@vconferenceonline.com Make sure to add this address to your Contacts list so emails will go into your Inbox. Once you're logged in to the Conference, you should be in the Conference "Lobby." 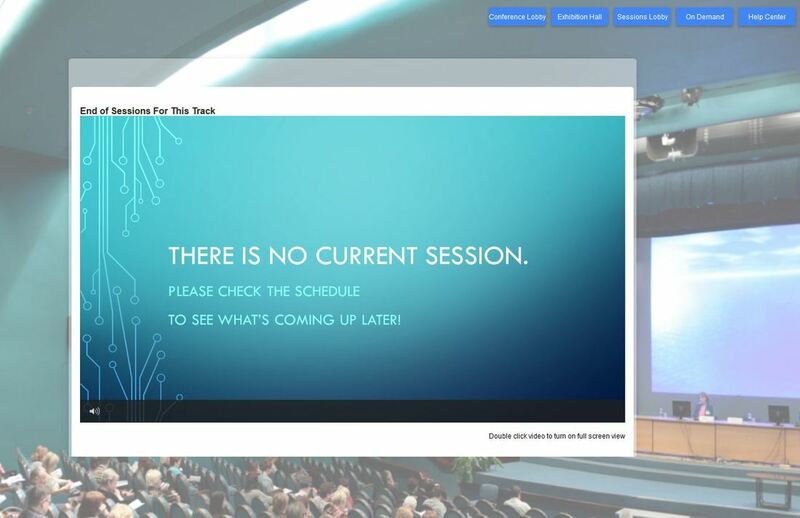 The screenshot shows a virtual Conference Center image with people standing around. 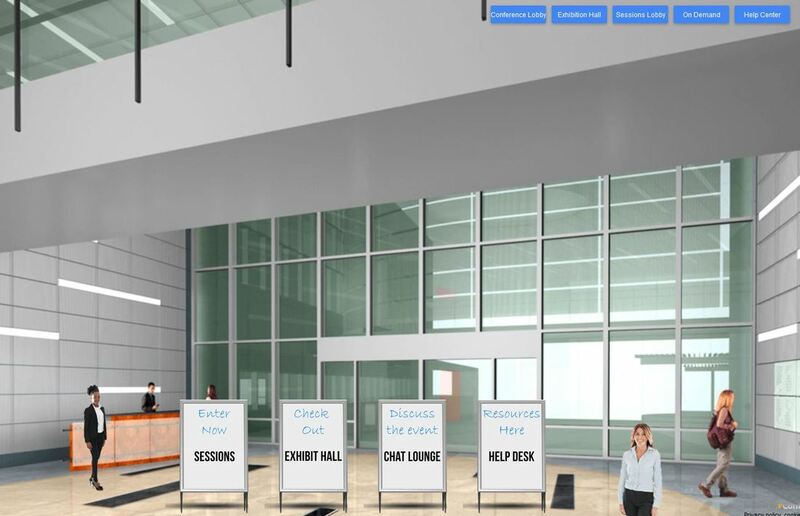 Four clickable "easels" stand side by side with Sessions, Exhibit Hall, Chat Lounge and Help Desk on them. you can click on each one to go to those "rooms." There are navigation links to these same rooms, plus an "On Demand" one at the upper right of the screen. The Session Lobby is where you enter the general and breakout sessions. 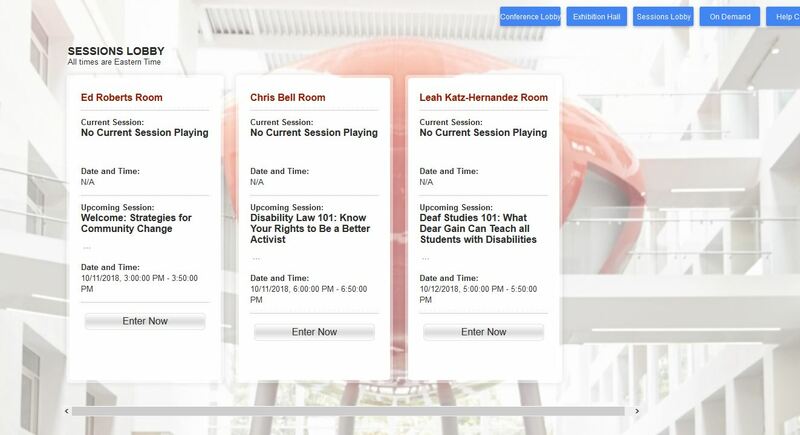 The screenshot shows a background of college students in a lobby and has three side by side boxes that announce Session times and which session is in which room. The rooms are named after disability activists: the Ed Roberts Room, the Chris Bell Room and the Leah Katz-Hernandez Room. Learn more about these important people. Session times, titles and rooms listed on our Schedule page. Each Session Room has a video player where you will view and listen to the pre-recorded presentations. Most of the sessions have at least two presenters who each speak for 10 or 15 minutes. Time is included for a live chat with the presenters for Q&A and to explore the topics more. Instructions for joining the Chats will be given. The screenshot shows a background of a theater with the video player on top of that. The virtual Exhibit Hall has booths for programs and services that you'll want to visit. The screenshot shows a background of a real exhibit hall filled with people. The virtual booths are arranged over that background as white boxes. You can click on each box to enter each Exhibitor. Exhibitors have information arranged as tabs with information about them, videos, links, giveaways and other information. The Chat Lounge takes you to a page that has links to each Chat, which are posted once they go live. Disabled & Proud is sponsored by DREAM at the National Center for College Students with Disabilities (NCCSD). The NCCSD is funded through a four-year grant from the U.S. Department of Education (P116D150005) to the Association on Higher Education And Disability (AHEAD). The NCCSD, AHEAD, and the US Dept. of Education may not agree with all content on linked pages and conference materials, and we can't guarantee the accessibility of external sites. The material on this website is available in alternative formats upon request; questions or concerns about accessibility should be sent to dream@ahead.org. All images are from Bigstock.com unless otherwise noted. Previous Disabled & Proud photos are used with permission of Syracuse University.